Engagement with the local community was a key part and major influence on these artworks for the new hospital development. Working with Stella the participants informed the over-arching themes and feel for the spaces. Comments from participants centred on a love for the locality, from going out for a walk in the local parks to the history of the market town. The entrance glazing artwork has an outdoor park theme, chosen to bring colour and nature to the space after coming in off the urban street. The design features trees standing gently with leaves flowing across the automatic entrance doors to the hospital. Overall there is a gentle flow of colour to blue linking into the ground floor palette. 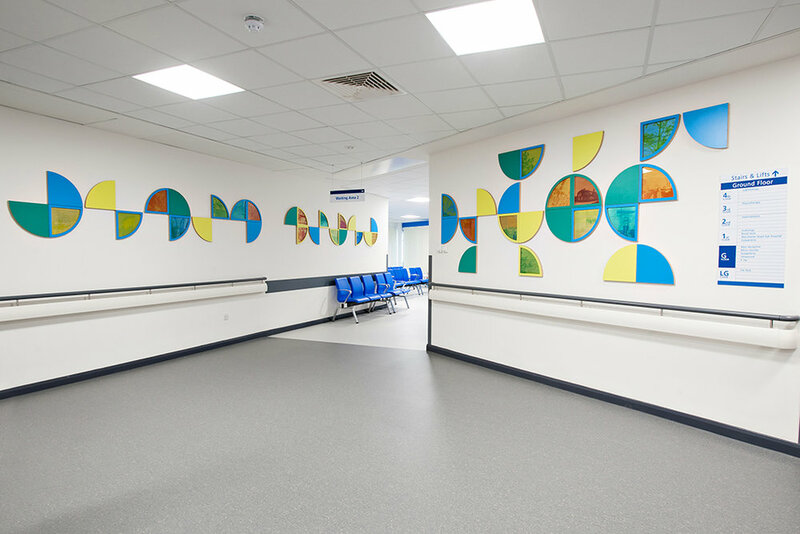 The design in the ground floor waiting area is based on the quarter circle shapes found on the façade of the Old Bank on the main street through Altrincham. Three groupings of these forms focus on the thriving market, the local parks and old buildings. The fourth grouping on the main wall is about the history of the town’s hospital services, from Dunham Massey in the First World War to the opening of the old hospital on Market Street. Vibrant colours complement the blue ground floor palette and the numerous images let people find something new on each visit.